MR CHOE Peng Sum had no idea when he joined conglomerate Fraser & Neave (F&N) 18 years ago that he would end up running one of the world's leading brands of serviced apartments. Mr Choe, 53, had just left a cushy job with Shangri-La Hotel, where he was a scholarship holder on a fast track up the corporate ladder. He had been headhunted to help diversify drinks company F&N's business after it acquired Centrepoint Properties in 1990. That business became Frasers Hospitality two years later. Mr Choe remembers every detail of his first day on March 31, 1996: "I looked around, I had a makeshift office, I didn't even have a secretary, and there (was no such thing as) serviced apartments then. "I was really frightened because in the Shangri-La, I had everything, the whole mechanism was there... Moving up the ladder was so good," he recounted. He recalls raising the idea of a serviced residence and having to convince the F&N board not to turn its property at Robertson Walk into a residential project. Under Mr Choe's leadership as chief executive, the brand has come a long way since 1998, from 400 units in two properties in Singapore, to 15,500 units in 92 properties in 49 cities today. Frasers Hospitality, which marked its 16th anniversary on March 31, is set to double the number of units under its ownership and management to 30,000 units in the next five years. "What took us 16 years to reach, we're going to take five years," he said. Speaking to The Straits Times in an interview at Fraser Suites River Valley, Mr Choe mapped out his game plan. FRASERS Hospitality, which has its own properties and operates serviced apartments on behalf of other owners, will focus on growing its presence mainly through clinching management contracts, Mr Choe said. "Most of the American big boys... they don't grow by owning properties, they grow through management contracts. But to grow that way, there needs to be a trust in the brand and a good track record." Now, 30 per cent of the firm's properties are owned, while the rest are under their management. The firm has five brands: Fraser Place, Fraser Suites, Fraser Residence, Capri by Fraser and Modena. Capri units are hybrid hotel and serviced apartments catering to guests on shorter stays, while the Modena brand is currently focused on China. Owning properties in prime locations is a plus, said Mr Choe, but "it needs to be invested in the right property cycle". He pointed to Europe, where property values are just on their way up from the bottom. He is bullish on the continent, especially Germany, where the firm is building a Capri property in Frankfurt that will open next year. The firm is also expecting to expand its presence in Berlin, Barcelona, Madrid and Milan. "We've been trying to pursue Europe for a long time... It's just that in the last two years, prices really dropped quite a bit, and it's a good time (now)," he said. In Asia-Pacific, Mr Choe is bullish on Jakarta, where there is a strong presence of expats from the oil and gas industry. The firm will open Fraser Place Setiabudi Jakarta next year. He also has his eye on Australia, where one more Capri property will open in Brisbane next year. Elsewhere, Frasers is expecting to add a property each in Bahrain and Dubai this year. But back home where the lion's share of the market is held by Far East Organization, the firm plans to expand through its Capri-brand residences to capture the growing number of corporate guests who come here for shorter stays. Frasers' flagship Capri property is in Changi Business Park, but Mr Choe noted the one-north area in Buona Vista is "definitely" the next place where "we're looking for more". MR CHOE acknowledges that "it will be a challenge" to reach the targets he has set, but "with a brand, it helps a lot". Back at the beginning of his journey at Frasers Hospitality, he had no track record on his side. Persuading others to join his team was also tough then. When the firm was ready to welcome its first guest, along came the Asian financial crisis in 1998, and his management was doubtful over the property's opening prospects. In a stroke of luck, firms were pulling out of Jakarta which was rife with riots at the time, and they came to Singapore seeking a safe haven. This brought an influx of expats which raised occupancy at Frasers' properties to 80 per cent, and the firm has not looked back since. Mr Choe also remembers preparing to roll up his sleeves to clean rooms and make beds during the Sars crisis in 2003, when he told the housekeepers that they would still be employed even if they chose to stay at home to avoid catching the virus. "I cried because they all looked at me and said, 'We're going in on our own accord. Don't worry about us, we'll take the risk,'" he said. 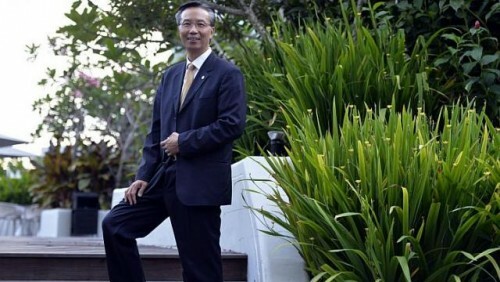 IN A way, the firm is a "child" that he has nurtured, but Mr Choe is confident that "we're definitely in a place to run it well" in the next five years, before it comes of age at 21. After Thai billionaire Charoen Sirivadhanabhakdi's recent takeover of F&N, the board has given "strong support for investment properties", he said. The firm also unveiled plans recently to inject some of its properties into a real estate investment trust. Mr Choe said the trust could comprise properties owned by Mr Charoen's TCC Group in addition to Frasers Hospitality's assets. Although these plans are likely to keep him busy in the coming years, Mr Choe is still very much a family man. The father of two daughters - Ruth, 23, and Rachel, 22 - says he never took up golf seriously because he relishes weekends spent with them and his wife, Evelyn. His daughters, who study at the National University of Singapore, are both athletes representing their faculties on campus, and the family spend weekends at the gym and enjoy sporty holidays. "I'm looking forward to trekking or skiing with them amid the sights and sounds of the mountains some day," he quipped.